For this month’s featured rifle, we will give you a sneak peek at our newest model, in a caliber that is also new, the 300 Blackout. We have had a lot of fun looking at accessory options to add onto this model, and have come up with a combination that we are very excited about. Please see the details in our Featured Rifle section below. The new 300 Blackout model will not be available for a couple months yet, but we plan on introducing it at SHOT Show in Las Vegas (Jan. 20 – 23), so come visit us at Booth #10376 if you will be attending the Show. As a Christmas bonus to all our friends and customers, we are offering a 10% discount on all retail orders through December 31st, and will include free Ground shipping for orders over $100.00. Merry Christmas from Windham Weaponry! 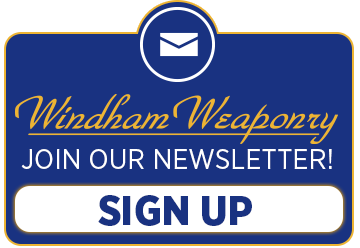 Note: For any last minute Windham Weaponry holiday shopping, we will be open Monday, December 22nd and Tuesday December 23rd, and will be shipping until 12:00 PM on Tuesday the 23rd. First make sure the rifle is unloaded. Then remove the lower from the upper by pushing out the takedown and pivot pins. Remove the pistol grip using a 3/16″ allen wrench. By removing the pistol grip it will allow you to make sure the trigger guard ear is able to flatly rest on the wooden block you will use to drive out the roll pin to avoid damage to the lower. When you remove the grip make sure not to lose the safety detent which is in the receiver under the safety, and the detent spring which is in a hole in the pistol grip. Cut two pieces of two by four and drill a hole in one. Rest lower on the blocks of wood and support the stock area with the pistol grip as shown. Slowly and carefully drive out the trigger guard roll pin with a 1/8″ roll pin punch into the hole in the block of wood. Press in the front trigger guard detent with the punch and remove the stock trigger guard. The DOA trigger guard should be orientated like this. Press in the single detent on the front of the trigger guard and insert it into the front trigger guard ear. Press in the two detents on the rear of the trigger guard and push them into the rear trigger guard ear until they click into the two holes. Reinstall pistol grip being sure that the detent for the safety is back in the hole in the receiver, and the detent spring is back in the hole in the pistol grip and up against the detent. Buy the DOA Trigger Guard here. What do you recommend for covering scratches on my rifle? We offer 3 products that work well, all available on our website. Birchwood Casey Super Blue Liquid Gun Blue. Love your newsletters. Keep them coming! WOW, keep up the great work you ALL do, and keep the e-mails coming. Thank you for newsletter , the wife & I own six HBC models & are very pleased with them. We’ve had friends of ours buy the same thing due to the fact they shot ours at the range & just flat out liked them. Thanks again for making a fine weapon. I truly enjoy my WW AR15 .223, I had a different Mfg.’s before I bought the WW, had a lot of problems and could not get in touch with them when I needed answers. My dealer took it back and gave me back my money that I put towards the WW. He no longer carries that other brand either. The Windham is made so much better and when I take it out to shoot I can be sure it will fire. The accuracy is amazing and I have commented to my friends who was looking for an AR to give the Windham a good look. Just wanted to pass along some good comments to you for producing a quality product. I wanted to again let you know how happy I am with my Windham HBC. I haven’t kept up with the actual round count, but I’m certain that it’s over a thousand, and I’ve had ZERO issues with my rifle. All of the rounds have been brass cased and from several different manufacturers in both .223 and 5.56. Magazines have all been steel USGI, Colt, and the nice WW included magazine. I plan on purchasing other rifles from the Windham line up in the future, as I have no regrets on my first purchase. Thanks for a great product and first class customer service. Oh, and keep those monthly newsletters coming. I know that they are a lot of work, but I always look forward to enjoying them. Diamondhead 45 Degree Off-set Integrated Sight System. Diamondhead’s D-45 Integrated Sighting System stows flat under magnification optics, but deploys quickly at a 45° angle with the push of a button if your optic fails or you need CQC sighting. This Front & Rear set mounts easily on any Mil Std 1913 Rail, and is machined of Mil Spec Type III Anodized Aircraft Aluminum for strength, light weight and durability. The combination photo shows the sight set folded flat, deployed from the rear, and deployed from the front. The patented, diamond shaped apertures and upper housing offer quick target acquisition, and centering. The Rear unit features same plane dual short & long range apertures that are the same height over bore as factory A2 sights. Rear sight windage adjustments are accurate to 0.5 MOA. Made in USA and Lifetime Warranty by Diamondhead. Set shown below as Front & Rear folded flat (top 2 images) and deployed from rear (middle) and from front (bottom). This photo was taken by Windham Weaponry’s Engineer, Matt Snow. “This is a photo of my personal .308 from one of my tree stands this year. It was the day before Thanksgiving when it was snowing like crazy“. He didn’t mention whether he got a deer, or if this was just more extreme weather product testing! I have been on the road for most of late November and early December. We had another successful Armorer’s Course November 13th and 14th here at the Windham Facility. Our friends from Academi bring excellent instruction to a very worthwhile two day event. Watch for information about our next course in Alpharette, Georgia next April, hosted by Windham Weaponry & Defensive Specialties, LLC. It was off to Las Vegas in early December, where we exhibited at the Rocky Mountain Elk Foundation Hunter Christmas Expo. The event was lots of fun and a chance to meet great people. We had a very busy booth, as we gave away a new Windham 7.62 x 39 rifle and had Professional Rodeo Cowboys Kaycee Feild and Cody Teel visiting in the Booth with us. 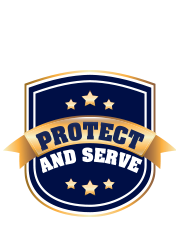 I hope the Holidays are great and safe for all our friends in the Law Enforcement community, and if you’re thinking of a new rifle for the New Year, please go to our website to see all the Law Enforcement model offerings www.windhamweaponry.com/le/weapons.asp#axzz38yWfyqpl and if you don’t see what you want, just let us know and we’ll see if we can custom build it for you. Glenn began working for Richard Dyke at Bushmaster in 1999 as the Facilities Manager, where he worked for 12 years until they closed in 2011. He joined Windham Weaponry when they opened in July 2011 in the same role. Glenn is our resident Jack of All Trades and takes care of everything from routine maintenance, equipment repair, construction, Hazmat disposal and everything in between. There doesn’t seem to be anything he cannot build or repair, and we can always count on him no matter what time of the day or night it might be. Glenn is always there to not only take care of the business park, but also the employees. There have been countless flat tires and cars with dead batteries for which he has come to the rescue. Outside of work, Glenn loves riding his Harley Davidson, boating on Long Lake, hunting and gardening, and he also knows his way around a kitchen!